Many email marketers are mostly concerned with the open and click thru rates of their campaigns. However, that’s just scratching the surface of what savvy email marketers are looking at today. You may have heard a lot about email deliverability, but to the novice marketer, if it’s opened then it must have been delivered, right? Not quite (more on that below), but even so, there’s so much more to understanding email analytics than just open, click-through and bounces rates when you’re seeking to deliver the best customer experience and to give you the best return on your investment. It’s easy to assume that once an ISP accepts an email transmission, it’s been delivered. Sure, that’s a crucial step. But genuine email deliverability is all about whether your message got into the inbox, not the spam or junk folder. To make matters more complex, there are cases where it can be accepted by the ISP but not necessarily delivered to the inbox because say, the ISP is throttling a connection when the amount of email being received is at too high a rate currently. Thus, even if the ISP shows a high “accepted” rate, your open rate could still be low. As a result you could waste hours A/B testing your email subject lines when the likely reality is that your message is going to the spam folder and you don’t even know it! But why, as a marketer, should you care about deliverability? 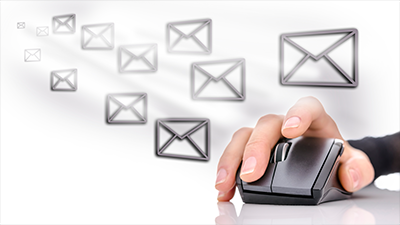 Because deliverability is a cornerstone of your ability to generate revenue from your email. Even after a message has been delivered, it may not (yet) have been opened. It could be that the subject line didn’t peak the recipients curiosity enough or the email was sent at an inopportune time of day. 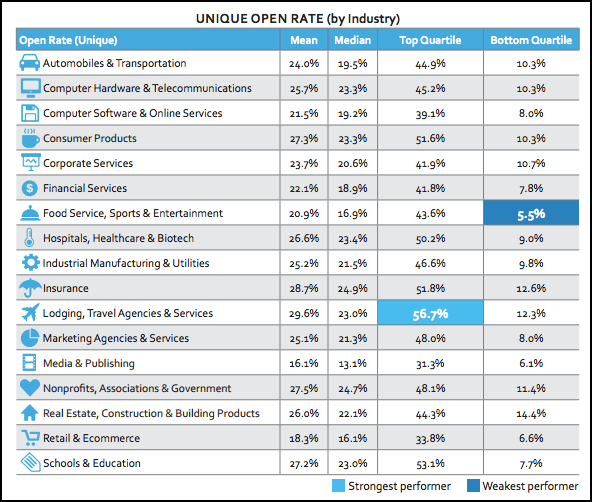 And, of course, the percent opened is directly related to your click rate. (A user can’t click what he or she hasn’t opened!) If the email was opened, but not clicked, a number of factors could be at fault: it could be because you have the wrong product, the wrong promotion, or even poor timing: the offer you’re giving may not be relevant to the user today, even if it might be at a future point in time. But before you toss your subject lines, remember that a low open rate percent might not be a direct indication that your subject line isn’t contextually meaningful enough, but it could be that subtle deliverability factors are in play. You might have authentication or throttling issues, or the ISP may never have delayed accepting your messages in the first place (soft bounce). For example, in the chart below, you can see that only 1/3 of messages are being accepted by this particular ISP on the first attempt, and although over 80% are being accepted by the fifth attempt. Of course, if your email is time-sensitive, this sort of delay is not the outcome you want to see! Note: These charts are an example of what you’d see in SparkPost. The 1st/2nd/3rd attempt is a level of reporting not all ESPs offer. ISPs may start to throttle or even suspend your email delivery when they think you’re sending too much email too quickly or otherwise present characteristics that suggest spam. For example, if you send out an email to your list, and it’s been two hours and no one has opened it, it might not be because of timing, but rather because of throttling. Each ISP has different rules when it comes to throttling. If you find you are being throttled (and, by the way, SparkPost can actually tell you which ISP is blocking you), you can contact the ISP or work with your email delivery service. But without those expert deliverability services, as a marketer you won’t know which ISPs are blocking you, leaving it a guessing game and that’s leaving money on the table. ISPs judge you based on your sender reputation. Your message deliverability also is tied directly to your “sender reputation.” Your email reputation is a lot like a credit score – including a lot of factors you build up over time. ISPs attempt to predict if the recipient wants the message being considered for delivery through a series of tests. The first being an empirical test of does your message looks like spam? ISPs aggregate data based on what they generally know about spammers and then compare that to your message. For example, if you are a new sender (i.e., have no sending history from a domain or IP address), have a lot of spam clicks, or have bad address bounces from the same IP or sending domain—well, then your message might get throttled or worse, not sent at all. ISPs also look at how people interact with your message. Do they usually open and click on emails sent by you? How long do they spend on the message? Do they put your email in a folder or forward it onward? These and many more factors are what ISPs look for to identify and block spammers. By the way, although your own marketing is the main factor in determining engagement and content violations with ISPs, one reason you might consider going with an email delivery service is because of the in-house expertise they provide to handle the technical aspects such as whether or not your mail server is set up correctly. If your mail server isn’t secure, for example, other people can send email through it unbeknownst to you. Moreover, email delivery services (like SparkPost) have expert deliverability teams with proven credibility and existing relationships with anti-spam systems and ISPs. Their expertise makes it much easier to determine and solve the root cause of deliverability issues. “Contextual, predictive and personalization” are buzzwords you probably have been hearing about email marketing recently. The reason is simple: these concepts really do have a profound effect on your bottom line. For example, we’ve already heard this year from Experian Marketing Services that emails with personalized subject lines boost open average rates by 29.3%! Interestingly, this factor seems to vary widely across industries, as shown in the chart below. 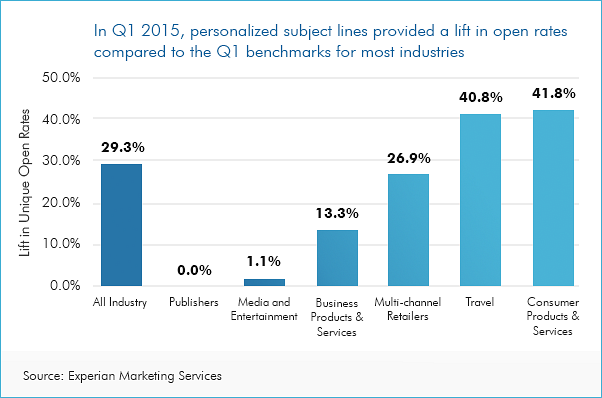 Personalization doesn’t just help with email open rates however, it also impacts revenue. According to Experian, transaction rates with personalized messages were 49% higher and revenue per email was 73% higher ($0.15 compared to $0.08). Yet only about 35% of the brands surveyed are using personalization. As a smart email marketer, you already know that list management housekeeping is a must. You’re savvy in the practice of scrubbing your list on a regular basis to remove hard bounces, unsubscribes and complaints. But good list hygiene goes beyond that to also removing emails that aren’t responding—in other words, pruning inactive segments. Inactive segments are detrimental to your bottom line because their relatively low engagement rate affects your sender reputation, which in turn impacts your deliverability, and which then further impacts your overall engagement (open, click, conversion). It’s a vicious cycle that has one solution: remember that list quality is much more important than list quantity. Don’t keep sending to users with poor engagement rates. It’s just not worth it! Basic analytics tell you how many people unsubscribed from an email. What you don’t know is if they unsubscribed because you were bombarding them with email or if because you sent something that was contextually not relevant. Industry average benchmarks help you make predictive and smart decisions based on this data. (See the industry average unsubscribe chart below for some ideas.) But that’s when you should look more closely at your sign-up form to see if you’re delivering on your promise. For example, if you choose to have a sign-up form that promises 10% off their first order, but which isn’t up-front that they’ll also get weekly emails from you, then it shouldn’t be surprising if you have a large amount of people who unsubscribe because all they wanted was the discount to begin with, right?